If Twisty, American Horror Story's resident clown of creepiness and doom, hasn't given you enough of a reason to stay home this Halloween (although he will get you there, too. 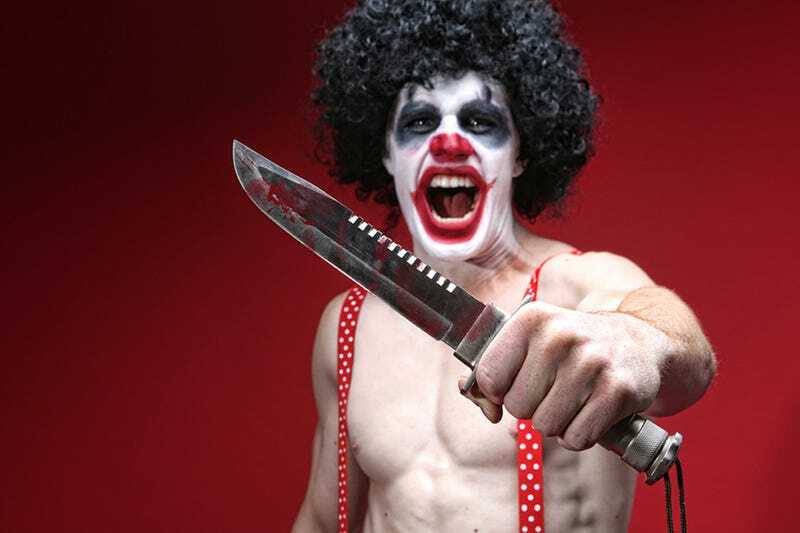 He's a clown), consider this chilling news: French police are warning citizens of violent attacks perpetrated by clowns with guns and knives. According to the BBC, police have been arresting evil clowns left and right. And while some of these clowns seem, like the Wasco clown, just to be out having a good time, some are traveling in bands (is a group of clowns a "car" or a "circus" of clowns?) with weapons and a thirst for blood*. On Saturday, police in Agde arrested 14 teenagers who were dressed as clowns wielding pistols, knives and baseballs bats. In Montpellier, a man in a clown costume was arrested after beating another man with an iron bar. And in Bethune, in the north of France, a 19-year-old was sentenced to a suspended jail term for threatening passers-by while dressed as a clown. That is terrifying. Not only that people are dressing as clowns, of course, (although clowns are scarier than both the Ann Coulter appearing at the food of your bed at midnight and Shadow People) (don't click that link!) but that they're using the opportunity to commit violent acts under the guise of anonymity. And police are worried that the internet has something to do with this. Because, of course. The internet is basically now responsible for all of the horrible things that ever happen in the world. And, The BBC reports, Reddit may be a big part of why people think doing this is cool. Police are also asking people to stop spreading rumors online. The police have obviously grossly overestimated their power. Only the weapons have been confirmed. The taste for blood is an assumption based on what I know about clowns.